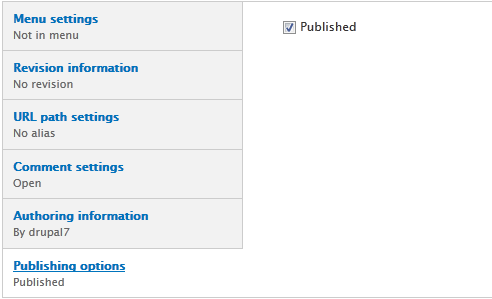 The "Published" option is used to publish the content. The "Promoted to front page" option is used to display content in the front page. The 'Sticky at top of lists' option is used to keep the content sticked to the top of front page. If you don't want to show "Promoted to front page" and "Sticky at top of lists" options, then you can hide those options using hook_form_alter(), hook_form_FORM_ID_alter() and hook_form_BASE_FORM_ID_alter(). If you want to hide "Promoted to front page" and "Sticky at top of lists" options only in single node form, then you can remove those options from node form using either hook_form_alter() or hook_form_FORM_ID_alter() in drupal 7. For example, we go to hide those options from article node form. If you want to hide "Promoted to front page" and "Sticky at top of lists" options in all node forms, then you can remove those options using hook_form_BASE_FORM_ID_alter() in drupal 7. Now you could not see those options in all node forms. 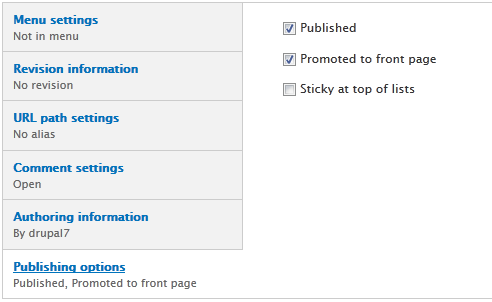 Now you know how to hide "Promoted to front page" and "Sticky at top of lists" options from node form in drupal 7. Thanks. Any idea how to do the same in Drupal 8? Probably, you could use similar hooks to accomplish the same.